President Obama on Thursday tapped Penny Pritzker and Michael Froman to serve in top-level positions of his economic team, nominating Pritzker to round out his cabinet as commerce secretary and selecting Froman to serve as the administration's U.S. Trade Representative. Announcing the two nominations in the White House Thursday morning, the president praised both for their "extraordinary" leadership and urged the Senate to confirm them quickly. "They operate with integrity, and they understand that public service is a privilege and you've got to do it right when you get involved on behalf of the American people," he said in remarks at the Rose Garden. "One of the reasons I'm proud to nominate them is they don't forget what matters." Pritzker, who heads the investment firm PSP Capital Partners, is the daughter of a co-founder of the Hyatt hotel chain. She is listed by Forbes as among America's top 300 wealthiest Americans with a net worth of $1.85 billion. She is a longtime supporter of the president's and has played key economic roles in both of his presidential campaigns. In 2008, she worked as the Obama campaign's national fundraising chairwoman; in 2012, she had no official campaign post but was a major Democratic bundler. "Penny is one of our country's most distinguished business leaders. She's got more than 25 years of management experience... She's built companies from the ground up. She knows from experience that no government program alone can take the place of a great entrepreneur. She knows that what we can do, is to give every business and every worker the best possible chance to succeed by making America a magnet for good jobs," Mr. Obama said. "She's got extraordinary experience anad in case I haven't embarrassed her enough she's got a wonderful family...and today is her birthday." The president then joked that, "for your birthday present you get to go through confirmation." "It's gonna be great," he said, chuckling. One possible source of controversy with Pritzker's nomination is her longstanding tension with the labor community. A former member of the Chicago Board of Education, she has been criticized by the teacher's union as "anti-labor" and "anti-worker," according to the Chicago Tribune; Hyatt Hotels Corp., on which she is the board of directors, also has a strained history with unions. Additionally, according to the Los Angeles Times, a bank owned by her family was involved in subprime mortgage lending, and collapsed in 2001. Froman is another longtime associate of Mr. Obama's. Currently serving as assistant to the president of the United States and Deputy National Security Advisor for International Economic Affairs, Froman was a managing director at Citigroup. He and Mr. Obama worked together on the Harvard Law Review during their law school years. 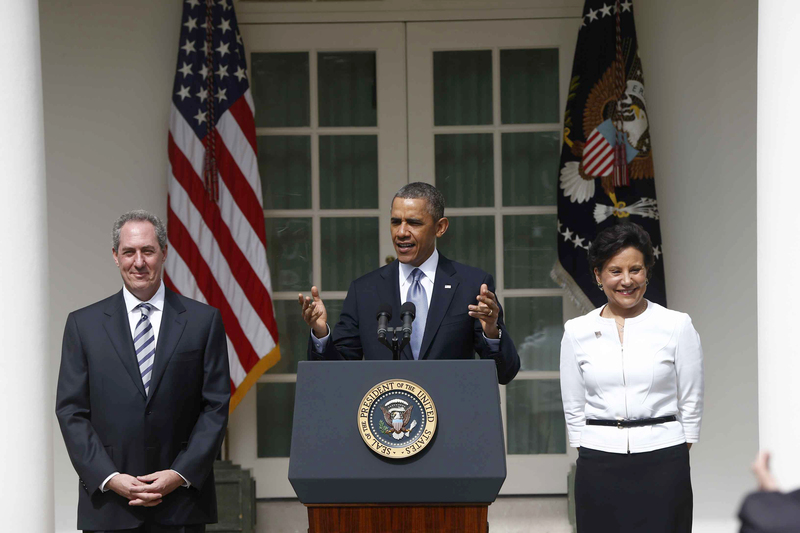 In the Rose Garden Thursday, Mr. Obama quipped that Froman "was much smarter than me" at Harvard and "continues to be smarter than me now." "Over two decades in both the public and private sectors, Mike Froman, who I'm nominating to serve as my United States Trade Representative, has established himself as one of the world's foremost experts on the global economy," Mr. Obama said. "Mike believes just as I believe and just as Penny believes, that our workers are the most competitive in the world, so they deserve a level playing field. And Mike's gonna continue to fight for that level playing field in his new role." If confirmed, Pritzker would be the fourth woman in Mr. Obama's current Cabinet, filling the post left vacant after John Bryson resigned last summer. Froman would replace Ron Kirk.